She has a Black Belt ranking in Brazilian jiu-jitsu as of May 2009. 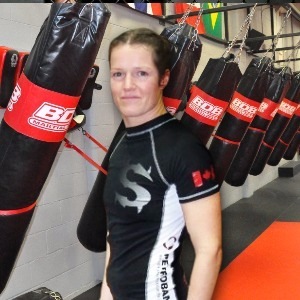 She was the first Canadian woman to achieve a Black Belt in Canada. She was the FILA Grappling World Champion in 2008, 2009, and 2010. So who is this Canadian Wonder Woman? Sheila and I met in high school. (So sweet, right? Settle in, this is a really great story…) We were 17 years old and we were both going to Alternative High School. This school was created for kids that weren't making it in the regular system, for all different kinds of reasons. The school taught an incredible foundation to each student; it was a very open environment, we were taught respect for others, respect for yourself, there was no judgment, you had a lot of freedom, and they taught different styles of learning, more expansive ways. Sheila and I would go play badminton, and according to Sheila, this was a date (so our take on this was that expansive learning was kept strictly to book-type things). She got tired of constantly being taken down or twisted into a pretzel. Well, she got tired of constantly being taken down or twisted into a pretzel. So she started to take an interest in it, and this was the beginning of the making of our Canadian Wonder Woman. So while we were learning and growing, we moved to Yellowknife for a while and not long after we came back to Calgary, and we started Champion's Creed. The foundation for our club really came from what we were taught at our alternative high school. It's an open environment, no judgment, a place where we respect each other and ourselves. We want everyone who comes here to have the freedom to learn in different ways and to really enjoy it. It's a good life, me, my wife, and our two children, along with the huge extended family here at the gym. Come into the gym and meet Sheila. She will be the one wearing the Wonder Woman belt, and she will tell you Wonder Woman isn't a fictional character, Wonder Woman is a mindset!